Last week I was in Bordeaux with a small group, and as well as tasting through most of the top 2017s, we visited a couple of prestigious Châteaux, and got a very brief look at the 2018 vintage. It was a lovely experience, and we really felt like we were being granted privileged access. This week is primeur week, and increasingly the leading Châteaux aren’t taking part in the main tastings. Instead, they expect people to come to them to taste. It used to be just the first growths who did this, but now there’s a whole slew of Châteaux with big ambitions who see themselves as part of the elite group. 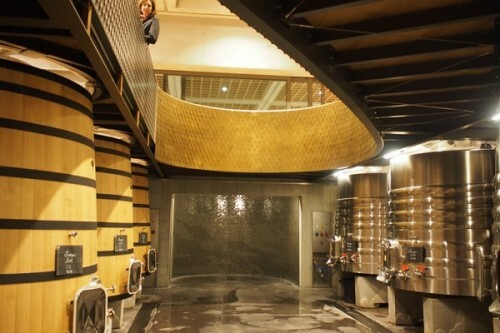 The invited guests will get special treatment, and given that the top places will be seeing around 1500 visitors over the week, each Château will get through around two barrels of the Grand Vin. Great piece, Jamie. Lots of good points, especially the bit about it being difficult to score famous properties accurately. I’m also more interested in less exalted producers. Wines that people actually drink. I’m glad that top Bordeaux wines exist but in terms of value many are not high achievers. I understand that the much-maligned-but-still-frequently-used 100 point scale isn’t linear. But even so, is a 96 point wine worth 20 x a 90 point wine? Might a slightly edgy 92 pointer from say Jura sometimes be more fun to drink than a 94 point 3rd growth? Does Bordeaux today justify all media attention? You state that there is a risk of subliminal influence if you are invited to taste at a top chateau. I’m sure that’s true. But there is no subliminal influence if you visit other wine makers? Who you may taste and socialise with – plenty of pictures of you doing that on here – and who may pay your expenses? Richard – why do your comments always obsess about who’s picking up the tab? There is always subliminal influence. It’s a question of degree. I’m merely commenting here on the social contract that can be created when there is an invitation into another world, with the attendant risk that this can be rescinded. I think since around 2000 the top chateaux have just become the crazy design label of the wine world. Recognisable names for dim witted members of the super rich to remember when trying to spend their vast wealth. Once a wine starts costing more than a months wages of the poor bugger who picked the grapes I think it is time to look for other regions, or for the scores of Cru B makers out there.